John Stevens, a Continental Army Colonel, practical engineer and inventor was an extremely early proponent railroads in America. In 1812 he wrote Documents tending to prove the superior advantages of rail-ways and steam-carriages over canal navigation urging the construction of a railroad to connect the Great Lakes with the Hudson River instead of the Erie Canal. The only railroads of the time consisted of horse-drawn carriages, extending short distances mostly connecting coal mines with canals. In the pamphlet Stevens devised steam powered locomotives, trains (which he referred to as suits) and their potential speed of 40 to 50 miles per hour. In 1815 he obtained the first railroad charter in the United States for the New Jersey Railroad Company, to build a railroad from Trenton to New Brunswick, New Jersey Unable to attract investment the line was not built (Stevens’ son Robert L. Steven’s eventually built the Camden and Amboy Rail Road on this path in the 1830s. It is currently the route of Amtrak’s Northeast Corridor). 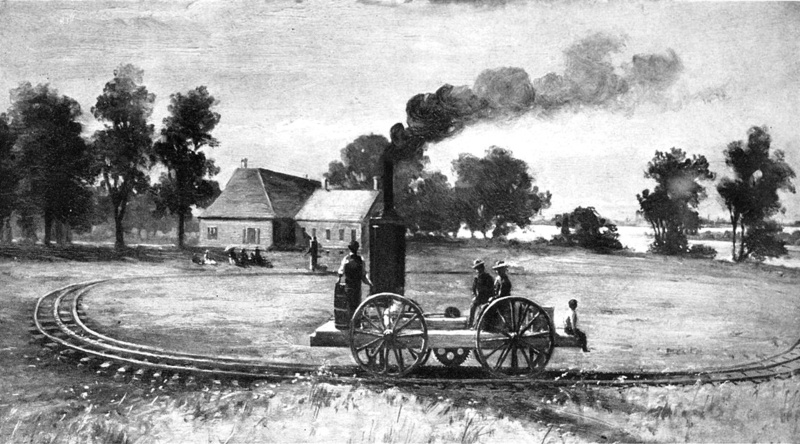 Although Stevens's locomotive never entered commercial service, the fact that it predated Peter Cooper's Tom Thumb by five years makes Stevens the true "father of the railroad in America." 1John Stevens: The Man and the Machine, by James Alexander Jr., a review of an early American railroad visionary.